The IU School of Education-IUPUI is deeply grateful for the extraordinary support and commitment of our donors whose generous gifts make a difference in the lives of our students, our faculty research and service and our collective impact on urban education and future generations. Through the generous support of many family members and friends of the Tefft family, the Patricia Tefft Cousin Scholarship was established in memory of faculty member Patricia Tefft Cousin. IU School of Education-IUPUI graduate Patricia Van Lue shares her personal journey as a recipient of this scholarship. The pathway to a college degree is rarely straight. Negotiating the lifestyle, the finances, and the mental and physical demands is a problem common for any members of a higher education student body. For some, the hardest battle is just getting there. Trish Van Lue's road to college itself was blocked for more than 20 years. Always one of her goals, college was simply out of reach for a long time because of everything else in her life. I never thought I would be here," Van Lue said. "I never thought I would have the opportunity. Nobody in my family has ever graduated from college. Van Lue did more than simply earn her degree. She graduated as a member of the Dean's List. She earned the Patricia Tefft Cousin Scholarship, named for the late IUPUI faculty member Patricia Tefft Cousin and given to "an outstanding undergraduate student majoring in elementary education with a demonstrated interest in special education, literacy or early childhood." Van Lue was also an IU School of Education's Chancellor's Scholar. As she finished her degree, her daughter completed her first semester at IUPUI. Just as it is a new beginning for Van Lue, it is the ending of a long and quite winding road. "I've been on my own since I was 17," Van Lue said as she began the tale of why her long-sought college degree took her 22 more years to complete. "I was the oldest of 4 children growing up in poverty. When college was mentioned, I was shot down with 'We're not going to have money for college, you're not going to college.'" That declaration from her parents came despite the fact she tested as gifted and talented by 3rd grade. While teachers encouraged her to seek out college anyway, she didn't. "When you're 17 and on your own and there's nobody around you who's ever been to college, you don't even know where to begin," she said. "I was too busy for a long time just thinking about surviving." In her senior year of high school, Van Lue dropped out so she could work two jobs. She joined the National Guard in hopes of earning money for college, but was dismissed after basic training. At 18, she married. She became pregnant, and during that time she and her husband lost their apartment, sending them to 3 months in a homeless shelter. Still, she returned to finish high school, graduating with honors. Van Lue began full-time work right after earning her diploma. As she struggled to bring in money to support her family, Van Lue said she also had to endure an abusive relationship. She left her husband when her daughter was 9 months old. At 22, she met her current husband. For the next ten years, they struggled, spending time in homeless shelters and struggling to keep afloat. She was sure that a college degree could change everything, so the couple decided to make a turn. "When I was 32 or 33, my husband and I sat down and said 'can we make this happen?'" Van Lue said. "I just realized I would never be complete until I followed my dreams." 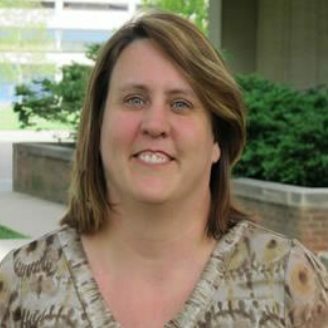 Van Lue was working as a certified medical assistant full-time when she began part time classes at Ivy Tech. Her studies began in business but she shifted to education. After a semester of evening and weekend classes, she left her job and opened a licensed day care in 2006. Through her experience working with children at her business and her early courses, she was sure education was the correct choice, though she admits she had to adjust when she came to IUPUI. "I really had to change my whole outlook on education because the program here at the School of Education is so different from what I experienced as a child," she said. In particular, she said the introduction of inquiry for young students surprised her, focusing the instruction on the students, allowing them to learn and discover through their own questions. "It wasn't work sheets," Van Lue said. "It was 'let's look outside and draw pictures of what we see and observe outside in science.' We would observe the fish and ask 'why do the fish get really still?'" Van Lue particularly cited the work of Special Education Assistant Professor Jane Stephenson, Clinical Assistant Professor Lonnie Gill, and Visiting Lecturer Jane Leeth. Throughout her student teaching, where much of what she taught was prescribed, Van Lue said her School of Education experience made her feel something more was possible in the classroom. "I've learned to ask how we can change this," she said. "How can we bring inquiry into a traditional classroom in a traditional school system." And of course, she knows better than to assume students who come from certain backgrounds are destined for certain failure. "When someone tells me that they're living in poverty, I can say, 'you know what, I grew up in poverty and now I own a 4-bedroom home in a nice suburban neighborhood,'" she said. "We have smart people that are living in poverty. We've got students who are capable of learning living in poverty. They just have to have a chance." Van Lue is proof of that. She already had a full-time offer before her student teaching was complete. Shortly after graduation, she began exploring teaching out of state; her husband accepted a job in Colorado, and the couple planned to move west. Having earned the degree and a measure of confidence in her teaching, Van Lue is sure she'll be in a classroom somewhere. The pathway has opened, in ways almost unimaginable a few years ago. "I don't know if I can even put it into words, because it's so..." she said as her voice trailed, her eyes fighting tears. "I think it just really taught me that if you put your mind towards it, you can do anything. Anything is possible if you want it badly enough."